Gorgeous spacious villa with private pool and breathtaking views. 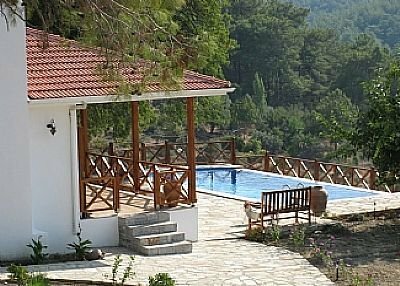 The villa is located on a hillside which has stunning views over the village of Gokbel, the lake, Iztuzu beach and the mountains beyond. The perfect place for total relaxation and al fresco dining while watching the sunset. The villa has been fully restored to a high standard and benefits from two open fires and full air conditioning. Double doors lead from the living area onto a terrace which incorporates an old Mulberry tree giving plenty of shade on those long hot summer days. The living area is traditionally open plan and includes a well equipped kitchen, dining and lounge areas for 6 guests. Set in 7000sq.m. of land The villa is surrounded by old olive and fir trees and includes an outside Turkish seating area (Kosh) over the original stone barn so making the most of the stunning views and sea breezes. On a lower level you will find the swimming pool Imagine sitting in the pool while cooling off and watching the sunset. The villa is located on a large plot of land and includes a private pool and several outside seating areas as well as many mature olive, mulberry and fir trees. There is also a bbq located by one of the outside seating areas below the barn. ‘Keci Evi’ is located on a hillside with stunning views over the village of Gokbel, the lake, Iztuzu beach and the mountains beyond. Perfect place for total relaxation and al fresco dining while watching the sunset. Keci Evi has been fully restored to a high standard and benefits from two open fires and full air conditioning. Double doors lead from the living area onto a terrace which incorporates an old Mulberry tree giving plenty of shade on those long hot summer days. The living area is traditionally open plan and includes a well equipped kitchen, dining and lounge areas for 6 guests. Set in 7000sq.m. of land Keci Evi is surrounded by old olive and fir trees and includes an outside Turkish seating area (Kosh) over the original stone barn so making the most of the stunning views and sea breezes. On a lower level you will find the swimming pool Imagine sitting in the pool while cooling off and watching the sunset.